Nowroozizadeh, B., et al. Unexpected Pathology Diagnosis in a Patient with Large Pulmonary Mass: Primary Pulmonary Hodgkin’s Lymphoma. (2016) Int J Cancer Oncol 3(2): 1-3. © 2016 Nowroozizadeh, B. This is an Open access article distributed under the terms of Creative Commons Attribution 4.0 International License. Primary Pulmonary Hodgkin’s Lymphoma (PPHL) without hilar node involvement is exceedingly rare. We report a case of a 41-year old female who presented with 11-month history of dry cough, and persistent mass-like consolidation in the left lung without hilar lymphadenopathy despite appropriate antibiotic treatment. The initial transbronchial biopsy was inconclusive, and a second CT guided transthoracic biopsy revealed a diagnosis of Hodgkin’s lymphoma. Accurate interpretation of imaging and pathology is important in the management of PPHL as it can mimic an infection or non-hematopoietic neoplastic process. A 41-year-old lady, otherwise healthy, was presented to her Primary Care Physician with an11-month history of non-productive cough and left thoracic rib pain. She had no fevers, chills or night sweats. A chest radiograph revealed a 5 cm area of masslike consolidation within her left lung, and she was treated with a course of antibiotics. A repeat chest radiograph obtained after two weeks of antibiotic treatment showed persistent left lung mass-like consolidation. Her laboratory studies showed: white blood cell count 15,100 cells/μL (differential: neutrophil 80% and lymphocytes 7%), hemoglobin concentration 11.4 g/dl, mean corpuscular volume of 94.9 fl, platelet count 321,000 cells/μL. The erythrocyte sedimentation rate was 34 mm/h (reference range, 0 – 10 mm/h), and the C-reactive protein was 0.4 mg/dl. A CT scan was performed and revealed left upper lobe mass with internal air bronchograms with mediastinal lymphadenopathy. There was no evidence of hilar lymphadenopathy. PET CT was also performed, which revealed high FDG avidity of the left upper lobe mass and mediastinal lymphadenopathy (Figure 1). A transbronchial biopsy was performed, and it was non-diagnostic. Figure 1: (A) Contrast enhanced coronal chest CT shows non enhancing mass in the left upper lobe lingula and left mediastinal lymphadenopathy; (B) PET-CT shows FDG avid left upper lobe lingular mass and bulky left mediastinal lymphadenopathy. She was referred to our institution, a tertiary center, after two months for further management. A repeat CT revealed no significant change in the left upper lobe mass and mediastinal lymphadenopathy compared to prior imaging. Peripheral blood smear was unremarkable aside from hypochromic normocytic red cells and mildly increased white cells. Bone marrow biopsy showed active trilineage hematopoiesis with moderate hyperplasia, normal megakaryocytes, and no lymphoid aggregates or granulomas. 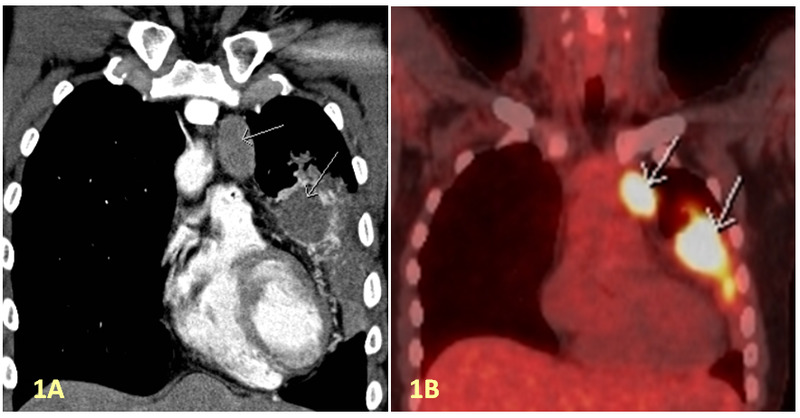 A CT guided transthoracic biopsy of the left upper lobe mass was performed. 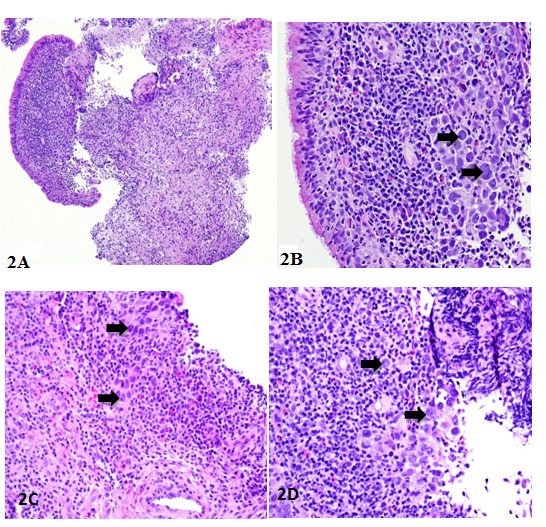 Histopathology revealed polymorphous infiltrate that included eosinophils, lymphoid cells, histiocytes, occasional neutrophils and scattered large atypical cells (Figure 2). Immunohistochemical analysis showed that the large atypical cells were positive for PAX5, CD15, CD30, and negative for CD45, CD3, and CD20, immuno profile was diagnostic of a classic Hodgkin’s Lymphoma (Figure 3). Figure 2: Transbronchial biopsy showing bronchial mucosa with submucosal atypical cellular infiltrates (A); higher magnification showing large atypical cells (Reed–Sternberg cells), resembling lung carcinoma, they are shown with arrow (B); invasive tumor cells infiltrating through bronchial wall with extensive chronic inflammation (C); areas of solid tumor cells were pleomorphic, mimicking high grade lung carcinoma (D). Figure 3: Immunostains for lymphocytic markers demonstrated positive cells for PAX5 (A); atypical large cells (Reed–Sternberg cells) are shown with arrow and are positive for CD15 (B) and for CD30 (C). No expression for epithelial and melanocytic markers. Immunoprofile is consistent with Hodgkin’s lymphoma. Primary pulmonary Hodgkin’s lymphoma (PPHL) is a rare disease. Pulmonary involvement in Hodgkin’s disease can occur in 15% to 40% of cases. Fewer than 100 cases have been reported internationally[1-2]. At an extra nodal location, such as the lung, primary pulmonary Hodgkin’s lymphoma (PPHL) is likely to be misdiagnosed for the more common occurring lesions, such as carcinomas at this site. PPHL affects women more frequently than men and it has a bimodal age distribution, either less than 35 years or greater than 60 years. Dry cough is the most common presenting symptom. Pulmonary involvement may appear as a solitary or multiple nodules/mass like consolidation, or cavitary lesions. The differential diagnosis remains wide, and includes granulomatous diseases, typical and atypical infections, and neoplastic process. Histopathologically, primary pulmonary Hodgkin’s lymphomas is most often nodular sclerosis type followed by mixed cellularity type. At an extranodal location such as the lung, the tumor cells often present as single or aggregate of atypical cells mimicking infiltrates of a poorly differentiated non-small cell carcinoma. A lung mass without hilar involvement on imaging should raise the suspicion of PPHL. Diagnosis of PPHL is often difficult with small core biopsies or fine needle aspiration cytology evaluation. Small biopsy and cytology findings may only show scattered a few atypical cells with enlarged nuclei and an inflammatory and fibrotic background. High suspicion and diligent work-up for a diagnosis of PPHL should be carried out when larger than usual single cells are seen embedded in fibrous or inflammatory tissues. PPHL is rare but can present as a lung mass, mimicking an infection or carcinoma. Histologically, it can be mistaken for non-small cell carcinoma. Correlation of imaging and pathologic findings is critical for an accurate diagnosis. High suspicion and application of immunostains for tumor markers are crucial in making an accurate diagnosis. 1. Kern, W.H., Crepeau, A.G., Jones, J.C. Primary Hodgkin’s disease of the lung.Report of 4 cases and review of the literature. (1961) Cancer 14: 1151–1165. 2. Boshnakova, T., Michailova, V., Koss, et al. Primary pulmonary Hodgkin’s disease–report of two cases. (2000) Respir Med 94(8): 830–831. 3. Yousem, S.A., Weiss, L.M., Colby, T.V. Primary pulmonary Hodgkin’s disease.A clinicopathologic study of 15 cases. (1986) Cancer 57(6): 1217–1224. 4. Radin, A.L. Primary pulmonary Hodgkin’s disease. (2006) Cancer 65(3): 550–563. 5. Cartier, Y., Johkoh, T., Honda, O., et al. Imaging of pulmonary lymphomas Hodgkin’s disease: CT findings in three patients. (1999) ClinRadiol 54: 182–184.